Three years ago Lewisham was named the most unsafe place in the country by the Institute for Economics and Peace. Now it’s in a renaissance period of civic transformation as projects, businesses, foundations and the council work together to inspire people across the borough to shape their shared spaces. How? Through civic crowdfunding. Here are the numbers behind Lewisham’s latest initiative. Lewisham Homes, the Esmée Fairbairn Foundation, Better Communities, the Timberyard, Growing a Greener Britain and Hyde Housing are six organisations currently supporting crowdfunding projects across Lewisham. Lewisham Homes has a special pledge pot to support projects that benefit Lewisham residents and groups. They’re pledging up to £5,000 or 90% funding of a project towards the crowdfunding targets of the best projects. The Esmée Fairbairn Foundation is a leading independent funder working across the UK who supports work in the arts, children and young people, environment, food and social change sectors. Individual project creators could receive a pledge of up to £2,500 whilst organisations could receive up to £15,000 for projects that fit the criteria. Housing your Ideas is an initiative from Hyde Homes to support their residents in Lewisham and throughout the country. They are looking to promote the most exciting, community-backed projects in the borough. The Timberyard, Deptford is looking to create a place for residents to come together to enjoy the great outdoors, meet with neighbours and be part of a long lasting community. They’re looking to back and promote projects that help to make this happen. LifeSkills with Barclays are using crowdfunding to get young people running campaigns that develop their skills. If you’re 16-24, they could pledge up to half of your fundraising target up to a total of £500. Learn more about the different funds and support available in Lewisham here. So far there are over 70 projects crowdfunding across Lewisham, from a £355 green house made from recycled materials to a £32,000 community-centered grocery store and deli in Catford that was backed by 340 local people alongside the Mayor of London and has since been nominated for the Time Out #LoveLondonAwards. The most recent project to start crowdfunding is the New Cross and Deptford Free Film Festival which aims to bring the community together through thirty free film events in Lewisham. Check out its project page to find out more and to pledge. 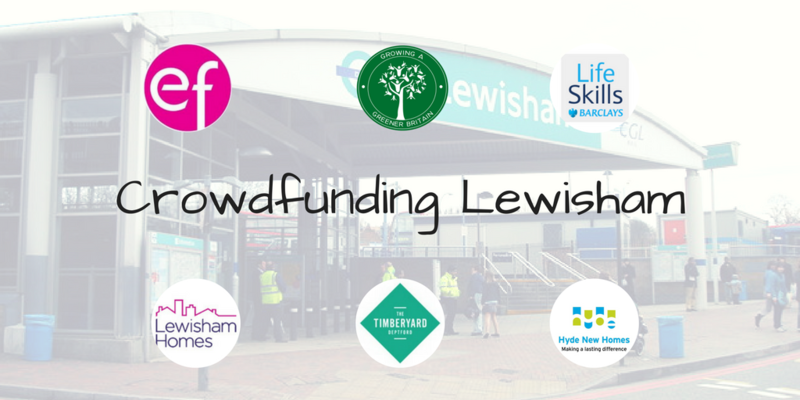 With 33 successful projects across Lewisham already, the crowdfunding movement is growing bigger every day! Crowdfunding brings together citizens, businesses and local government to fuel the change happening in local areas. There has already been over 1600 backers supporting crowdfunding projects in their communities. With over £300,000 in funding available alongside support and training through regular events and webinars, the people of Lewisham have an amazing opportunity to lead the way in civic transformation. Find out more about what’s happening across the borough and get involved here.